Armed with what I thought was greater scrambling-up-hills fitness, a brilliant new bike from Brant to race on, a checked and double-checked seatpost for non-slippage and most importantly prior knowledge of the race, I was confident I was going to do better at the Three Peaks than my first attempt last year. We even arrived in Helwith Bridge earlier than last time, so all was good so far. After parking without mishap and an uneventful signing on, I enjoyed an incident-free start to the race alongside Phil, Dave, Simon and Budge where I immediately found space and shot off as fast as I could. After the shock of last year’s start I was ready for it this time and made the most of it. So did Phil and judging by the way he rode off in front, so did Dave. Phil and I started to take it steady and stayed with a fast group. Soon enough we were riding across the fields towards the first big climb up Simon Fell towards the summit of Ingleborough. The steepness of this climb really can’t be conveyed adequetly to anyone that hasn’t climbed it before, with or without a bike on their back. It just couldn’t be any steeper or everyone would fall off backwards. There are some great photos here that kind of explain things a bit better than words though. What I do know is that the Rodwell was several times more comfortable to shoulder for long periods of time than the Planet X. This is without padding too. The top tube has got a ‘flat bit’ that does the job really well, surprising really what a difference this makes over a regular round profile. This hill is ridiculously hard going but definitely easier the second time around. I was climbing well and passing several other people. My ‘very small steps on my toes’ technique was working and I was glad I heeded Dave Haygarth’s advice to remove my toe studs as I didn’t need them. I looked back and I had lost Phil (who I knew was good at this climbing lark) so I was happy for the time being, I was clearly doing ok.
Over the stile and at last it was time to get past a many people as possible. The Rodwell had only been built a few hours before so this was essentially the first ride on it. The bike immediately feeling snappier and easier to get up to speed than my other cross bike, the steering feels somewhat quicker too – less relaxed and fun in a, ‘you’d better be concentrating, pal’ kind of way. I was in the big ring as much as possible, passing several other riders (one of which crashed into me and then blamed me) until the constant rattling over the rough ground caused one of the bottle cage bolts to fall out (that’s hasty builds for ya), leaving the cage flopping about with a bottle in it. I stopped, fumbled for the multitool and eventually sorted out the problem but it cost me enough time to see Phil and dozens of other people ride past, people that I had just worked so hard to get past just a few minutes ago. On the descent of Ingleborough I made up some time again and pulled out all the stops on the road to Whernside. 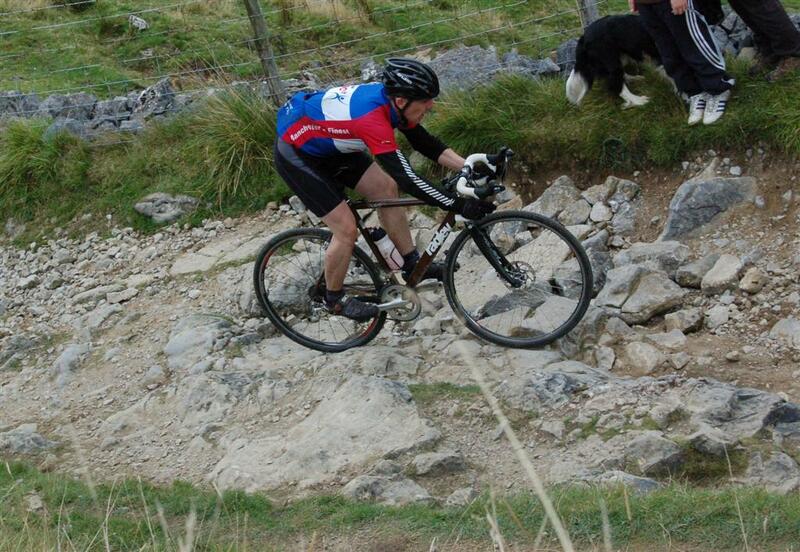 I was gaining on Phil again and by the time we reached the top of Whernside I was one bike behind him. I’m not hell-bent on beating him, but the fact that I’d caught him again meant that I was still going well. I hadn’t forgot in 12 months how scary the descent of Whernside was and this time it didn’t disappoint; flights of steps follow rock-strewn narrow rutted tracks followed by long stone pavements with wide, deep gaps between some of the slabs. Stone water channels running across the trail at regular intervals have to be jumped over to avoid punctures whilst ramblers and other riders, many of them walking/running, need to be avoided. There’s a stile part of the way down this hill that requires a dismount. As I was climbing off the bike my right calf started to spasm, I climbed the stile and then couldn’t get over it – by now both my lower legs were in complete rock-hard cramp leaving me straddling the stile with the bike still resting on my shoulder, the air quickly getting a distinct ‘blue tint’ as I struggled to deal with the pain. I’ve not had cramp for 5 years or so. I’ve no idea how to deal with it apart from swear at it (that incidentally doesn’t work). Eventually the cramp subsided and I carried on, quickly gulping down fluid as I had just been reminded that I hadn’t been drinking enough since the start. I collected another bottle from Deb who was waiting for me at Ribblehead and carried on as fast as I could along the road to Horton-in-Ribblesdale and the final hill, Pen Y Ghent. It was however now clear that cramp was going to be a constant companion for the remainder of the race – each time I attempted to accelerate or climb even the smallest of hill I was rewarded with more muscle spasms in both legs; every time I tried to pull my foot on the upstroke my calf hurt so I was reduced to pedal-mashing. Not only that, but it appeared to be spreading to my thighs. I dug deep and eventually I got to within a few feet of Phil again, however I’d used up most of what I had left in the tank in the process. No worries, it wasn’t for nothing if I’ve regained my earlier position, I thought. Eventually Dave then Phil both passed me, already starting their way back down as I was almost at the summit of PYG. I dibbed at the top and started my ascent, exchanging a few words with Simon as he climbed. The descent was probably one of the most sketchy things I’ve ever done on a bike. I was being bounced around all over the place on the dry, loose gravelly track, eventually reaching the relative safety of the stone slabs and then the bridleway to the road. Just the road now to the finish, legs still doing their new ‘thing’ of trying to make me cry and fall off my bike. I joined a couple of other riders and hung on to a wheel as best I could. I finished in 4:03, ten or so minutes faster than last year. I’m pleased by that, but at the same time annoyed with myself for getting wrong something so fundamental as feeding properly. Next year will be different. Good ride! I think I need to practice getting up hills before next year! 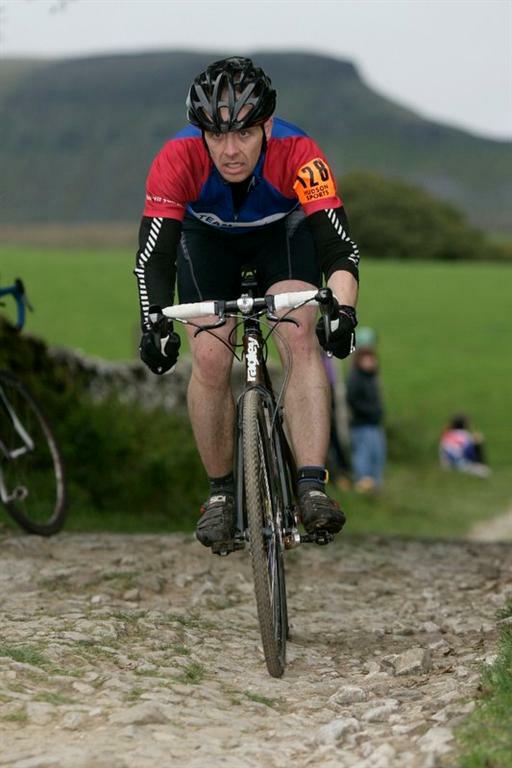 I need to make a slack head angled cross bike don’t I. Well done Jason, particularly on a bike that you built up the night before (that is brave). I had cramp the first time I did the Three Peaks and I think it is a combination of going at the right pace (i.e. not too fast) and a different body position when carrying the bike up those hills. What is the head angle on the Rodwell? I know its expensive but a Ti frame really takes the edge off those descents. Was laughing at Brant’s comment – I thought the angle looked well slack on that bike – was amazed you could describe it as twitchy – though maybe that’s my interpretation. It looked to do the job well for you and those bendy stays will have helped on a rocky bumpy race like the 3 Peaks. Glad you PBd and you’re a cert for well under 4 hrs next year if all goes well. Fingers crossed. Compared to most other cross frames of a given size, the Rodwell has a slacker head angle and a shorter effective top tube length. Do you think this was why it was twitchy!!? Is there are reason for choosing this geometry? you’d have to ask Brant.